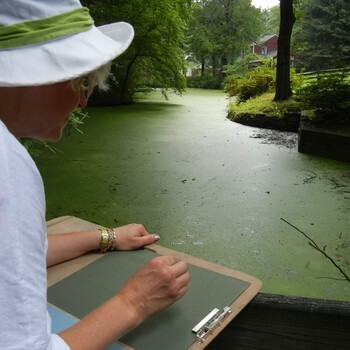 Drawing and painting outside on location is a wonderful way to learn perspective, understand depth, and see light and color in its natural form. The Drawing Room offers many opportunities for students to experience the outdoors and capture its beauty in their artwork. Hike and paint in all seasons. Bring a lunch and enjoy the great outdoors for AM or PM sessions. 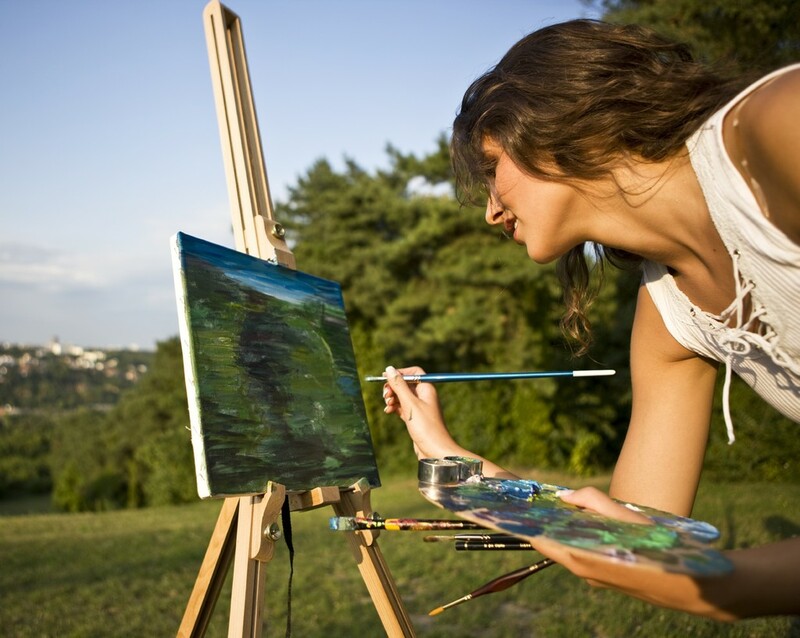 Learn how to paint skies, trees, lakes, oceans, and more. Available at one of our select outdoor locations or choose your own! This program is perfect for individuals, families, and groups. Acquire skills in figure drawing while listening to and learning about different musical genres. 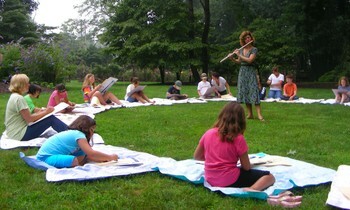 Flutist Carla Auld plays music while students draw and paint her. As Carla moves and plays, students receive in-depth instruction form teachers. Carla then encourages students to illustrate what they see and feel from the rhythm and tonality of a specific piece of music. We supply all art materials. 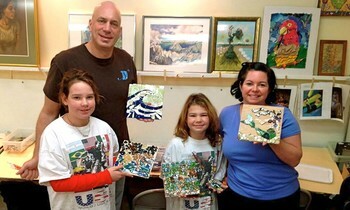 We have been providing quality After School Art Programs in area schools for over 14 years. We customize programs that meet your schools’ scheduling and creative needs. Our staff provides all of the materials, demonstrations, and instruction needed to create a fun art experience for students in their own elementary school. Programs are $30 per child for a minimum of 8-week sessions. Click for pictures and a list of different themes to choose! 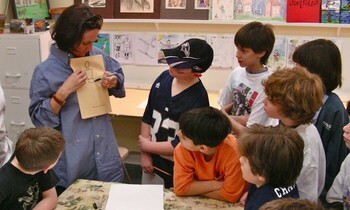 Our director is a certified art counselor who can guide scouts in completing their art badge. We provide individual, small group or whole troop instruction in our studio or at your location. Have fun while creating art for Eagle Scout Projects, community service projects, fundraisers, community spaces, libraries, and more. $30 per scout for 2 hours of instruction, this includes all supplies. There may be a slightly higher cost to travel to your location. We offer a variety of workshops for both adults and children including figure drawing, watercolor, acrylic, oil, drawing, clay, collage, mosaics, and sculpture. Holiday themed workshops are also offered. 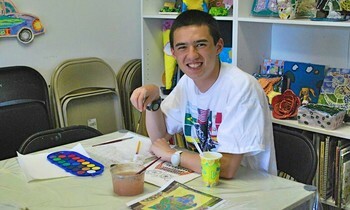 We provide individual, small group and inclusive art experience for children and adults. Our program is designed to develop fine motor skills, as well as social and artistic skills in a warm and safe environment. Appropriate lessons and projects tailored to your students’ needs. We work with students at the elementary and middle school level. We work with students assisting them with their school projects. Our professional staff works one on one with students to improve particular skills and help them meet their individual artistic goals. $80 per hour – 24 hour notice for cancellation or full fee applies. We create a dynamic art experience for your school’s next theme or culture day that meets your programs goals and objective. We provide the materials and experienced art instructors to provide your students with a fun, memorable creative experience.